Busting the Bracket: Sampson favoring St. John's? LeBron James was not the only the St. Vincent-St. Mary product with a big decision on his hands lately. Rising senior Jakarr Sampson, from the same high school as James, has seen his recruitment expand as he shoots up the national rankings, but he could be closer to narrowing his school list. Despite that, a report Monday morning claiming that Sampson had named three favorites is false, according to Sampson and his AAU coach with the King James Shooting Stars, Donald Anderson. “No I don’t have a top three yet,” Sampson told me Monday. With that said, he is indeed mapping out which schools to visit in the fall. “He plans on visiting Baylor, St. John’s, Kansas, Louisville . . . and [we] haven’t chosen the fifth school yet,” Anderson said Wednesday morning. In the mix for that final trip are Michigan State, Tennessee and Miami (Fl.). Although both claim that there is not a top three, Sampson gave a hint as to who might be the frontrunner right now. “If I did have a top 3, St. John’s would be number one,” he said. 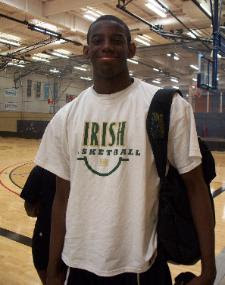 One issue surrounding the 6-foot-7 swingman is his academic situation; many people on the recruiting circuit have questioned whether he will be eligible as a college freshman in 2011. Anderson attempted to put those rumors to rest.